Robust Chlorine Gas Valves from Sherwood feature a heavy-duty body and packing nut for increased load carrying capacity and resistance against stress corrosion and cracking. 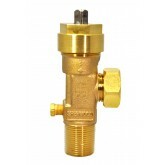 These valves have a robust Aluminum Silicon Bronze (C64210) valve body which offers corrosion resistance. The design is approved per the Chlorine Institute Pamphlet 17 Alternate Design Criteria. This design retains same outlet, inlets, pressure relief device, packing ring, packings, follower, outlet cap, wrenches, yoke and materials as the basic valve. 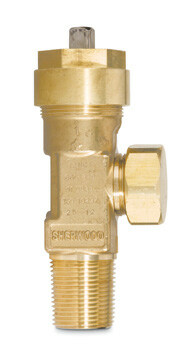 These valves have a One-piece Monel® stem that offers exceptional durability and positive shut-off in chlorine or other corrosive gas service, a choice of PTFE or Garlock® 6130 packing for easy operation and durable leak-resistant stem seal and large wrench flats on valve body for easy installation.